As an organization, if you are providing corporate owned devices along with SIM cards, then it is quite important to monitor the data usage and set alerts when the consumption reaches a threshold. MobiLock lets you check the data usage of your Android and iOS devices and set alerts on data consumption. Please follow the guide below to monitor the data usage and set an alert. ✅ You must have a valid MobiLock dashboard account. 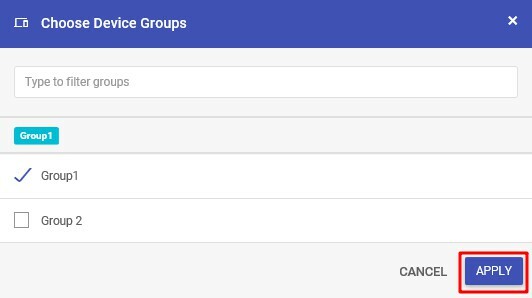 ✅ All your devices must be in a device group. From your dashboard, go to Reports & Alerts ➔ Reports. 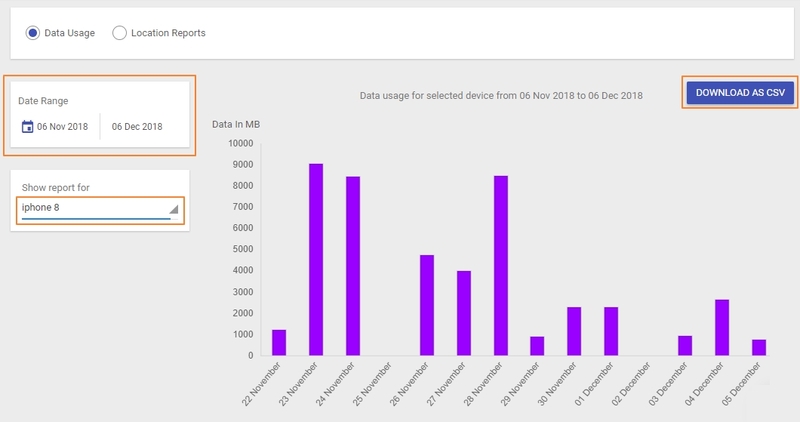 In the Reports screen, select Data Usage. Select a start date and end date from Date Range. Select the device from the dropdown list for which you want to generate report. The following image illustrates a generic data usage report. You can also download the report as a CSV file by clicking on the Download As CSV button. The data usage report is an indication and will vary from the actual carrier/operator data usage report. We normally expect a 10% variance but in some cases it may be more. On iOS devices, MobiLock iOS Agent 2.0.1 and higher is required for Data usage collection. MobiLock client needs to be running in the background for data collection to be synced with server periodically. iOS devices also recycle the data usage counter after every 4GB, so if the device consumes more than 4GB of data before MobiLock can collect the information, then MobiLock report might not be accurate. We have made sure to collect the information as often as possible. Select a device profile to edit. From the Restrictions tab, select General Settings. From the MobiLock Agent Wake-Up Setting dropdown list, choose a suitable wake up time. From your dashboard, go to Reports & Alerts ➔ Alerts. Enter a name for the alert and click Save. Click on the slider next to Data Usage Alerts to enable the alert. Select a billing cycle from the dropdown list. Select the frequency for alert notification from the Alert Frequency dropdown list. Click on Apply To Device Groups button in the upper right corner and select the device group to want to apply the alert. Click on Alerts under Reports & Alerts to apply the changes. Your custom alert will be visible under the Alerts page. You will start receiving the alert notifications in your email based on the email settings. You can also delete, rename, or make a copy of the existing alert. To perform these actions, click on the three dots next to your alert and select the appropriate option.